Our innovative cider project reduces London’s food waste by rescuing unwanted fruit from rotting. Can you help our hub to keep thriving? This will mean that the costs of bottling and labelling our 2018 cider will be covered. This is one of our biggest costs and means that we can then start selling the cider and get it out to shops and markets near you! The Orchard Project Community Cider needs you! Help us to reduce food waste and put our community-made cider on the map. The Orchard Project has been producing delicious Local Fox cider and apple juice from London’s unwanted apples since 2016. Our drinks are made purely from fruit harvested in London - 100% local and no air miles. The fruit we use is donated or rescued from gardens, orchards and parks where it would otherwise be left to rot. While our London-brewed cider movement continues to bloom, its funding from the Heritage Lottery Fund is sadly coming to an end. Can you help us keep rescuing the city’s unloved fruit and turning it into something beautiful? Every year, hundreds of tonnes of apples are left to rot across London’s parks and gardens. As the nation’s only charity dedicated to reviving and strengthening community orchards, we felt compelled to act. In 2016, we rescued 2 tonnes of fruit. In 2017, we saved 7 tonnes. This year, we are on track to transform 13 tonnes of apple-and-pear-spares into unique, scrumptious Local Fox Cider and London Apple Juice! On top of that, we outgrew our cider premises, moved to new ones and trained over 700 volunteers in harvesting, pressing and bottling. To thank our generous apple donors and improve the city’s fruit-growing capacity, we’ve given back 1,700 litres of cider and juice and provided tools and training to the community orchards and individuals involved. Don’t let all this fruitful good work come to an end! Please help us continue transforming wasted fruit by supporting our community cider hub! We need to raise between £17,500 and £25,000 through this crowdfund campaign. By raising our minimum target of £17,500 we can keep the doors of our enterprise open and continue to engage with volunteers and press the 18 tonnes of fruit that we wish to press next season. By reaching our stretch target of £25,000, the material costs of bottling and labelling our 2018 vintage cider will be covered. This will ensure that we have more product to sell to the public from spring 2019, a vital part of ensuring that the enterprise continues to grow and become more sustainable long term. Our wonderful volunteers and supporters have already started fundraising for us through sweepstakes, facebook fundraisers, generous donations and market stalls. We are now reaching out to YOU with this crowdfunder. We have some wonderful rewards* on offer and we hope you will want to support out mission to keep squishing these unloved apples! Local Fox Art Print - limited edition and signed by Carys Tait, our illustrating hero. Please note that the reward is for the art print only, no frame included. What have we done so far to help the project become more sustainable? We have developed a 3 year business plan to map out how we grow and work towards becoming sustainable, we are testing out different models, including sourcing apples that would have gone to waste from commercial farms to make into a new product that will sit alongside Local Fox to increase our profitability. Our processing knowledge and skill has increased significantly in the last 3 years and we have increased the range and type of places that we now sell our cider. We are still on the look out for new stockists so please do get in touch with us if you would be interested in stocking us in the London area. The Orchard Project is the only national charity dedicated solely to the creation, restoration and celebration of community orchards. We aim to make a serious contribution to a better food system. 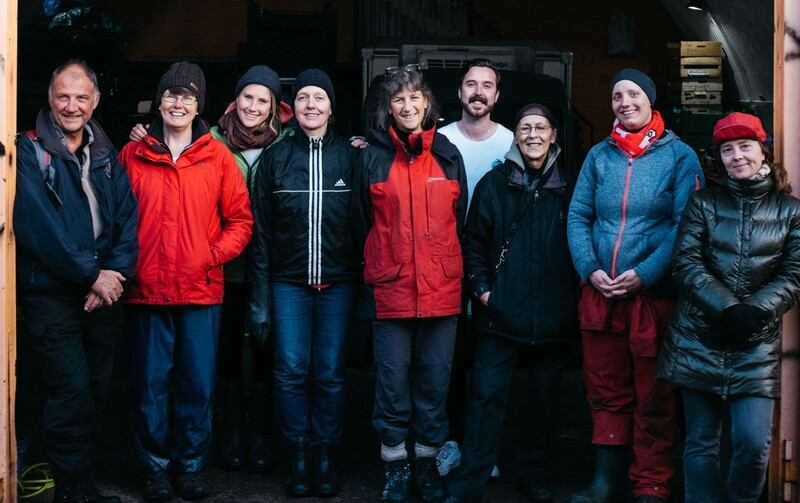 We work closely with community groups in hubs around England and Scotland helping to design and create new orchards that will last for decades to come. We rebuild orcharding skills and knowledge, run fantastic orchard celebration events and help groups make the most of their bumper harvests.  There is a lot more info about what we do and why on our website. We are a registered charity, number 1139952. *If you would like rewards delivered outside of the UK, please contact us before you pledge as we may need to charge an additional postage fee. Our beautiful Local Fox illustrated organic cotton tea towel, an orchard lover to the core Magnet, a Clearspring snack bag and two Local Fox Gift cards. A pack of 4 gift cards with our beautiful Local Fox design, perfect for giving this Christmas or at any time of year! Plus our name on our supporter page. A natural cotton Fairtrade tea towel printed with our lovable and cheeky Local Fox character and London skyscape. A great gift, but we think you might want to keep it for yourself! Plus your name on our supporter page. Giving Tuesday Limited Edition Special Offer! Our beautiful Local Fox illustrated organic cotton tea towel, an orchard lover to the core Magnet and two Local Fox Gift cards. 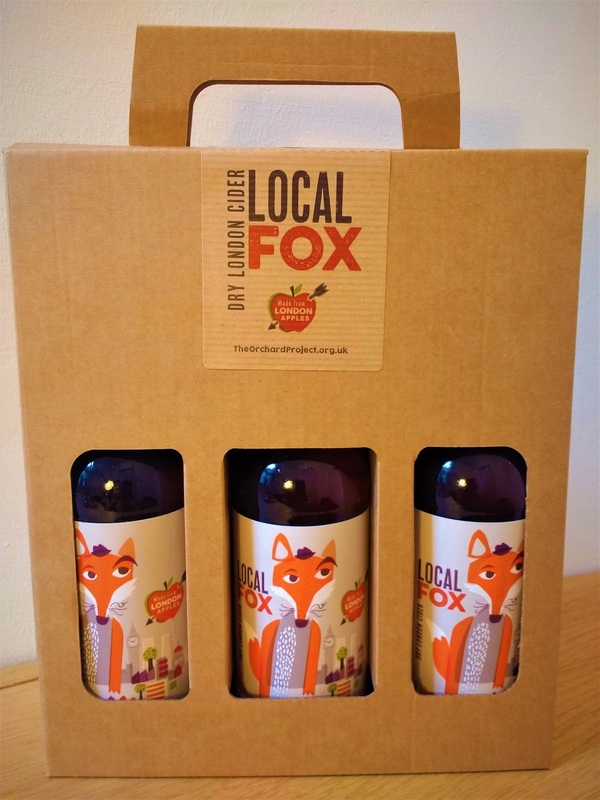 Two presentation gift boxes with 3 bottles in each of our delicious Local Fox Dry London Cider. Collection will be from our stall at Walthamstow Winter Wonderland market in E17 on either 9th or 16th December or from our office in Hackney on any week day.Plus your name on our supporter page. A presentation gift box of 3 bottles of our delicious Local Fox Dry London Cider, along with an 'Orchard lover to the core' magnet. Plus your name on our supporter page. A signed copy of 'The Cider Insider: The essential guide to 100 craft ciders to drink now', from Susanna Forbes of the Little Pomona cidery, along with a 75cl bottle of their Art of Darkness dry, still cider and an Art of Darkness t-shirt. A great gift for the cider lover in your life! Two bottles of organic and flavoured apple cider vinegar, brand new to the market, from our friends at Clearspring, with some of their yummy snack bags thrown in for good measure. Your name on our supporter page. Learn how to prune fruit trees with an expert from The Orchard Project. The location will be a central London orchard on Saturday the 2nd February 2019. Go away with the confidence and skills that you need to prune your trees in your garden or local community. A lovely hot mulled cider at the end plus your name on our supporter page. A Gift box of our Local Fox Dry London Cider, a bottle of apple cider vinegar and snacks from Clearspring, our orchard lover to the core Magnet, two Local Fox illustrated Gift cards and our beautiful Local Fox organic cotton Tea towel. Grafting workshop and take away a fruit tree! Attend a grafting workshop with us in London on Saturday the 9th March and take away a fruit tree that you have grafted! Plus your name on our supporter page. A limited edition high quality art print 30cm x 40cm of our beautiful Local Fox character with London cityscape, numbered and signed by illustrator Carys Tait. A great gift for kids or adults alike! A box of 16 bottles of our delicious Local Fox Dry London Cider. Collection will be from our stall at Walthamstow Winter Wonderland market in E17 on either 9th or 16th December or from our office in Hackney on any week day. Plus your name on our supporter page. Two tickets to a London Ciderology tour run by UK cider expert Gabe Cook (dates tbc). Alongside a signed copy of Gabe's book - Ciderology: From History and Heritage to the Craft Cider Revolution. And of course, your name on our supporter page. A £15 saving on the normal retail price. A bottle of limited edition gin made on-site at Michelin starred restaurant Fera at Claridge's. Only 100 bottles of this gin will be made, it's very special and would make a wonderful treat this winter. Plus your name on our supporter page. A visit to our cider house for an experience day which will include operating our pressing equipment, a cider tasting experience and then taking away a gift box of our cider. We will send you a voucher if you wish, so that you can offer this as a gift. By buying this reward, you become one of our 'Apple Angels' and your name will be put up on the wall at our cider house in Walthamstow E17. A member of our team will come to your home or allotment (within M25) to advise you on how to prune your fruit trees and teach you the basics (over a 2 hour session). You will also become one of our Apple Angels with your name on the wall at the cider house! A year's supply of our cider! A year’s supply of Local Fox cider delivered to your door. 52 bottles of our beautiful crisp cider is finding its way to you. Host a cider party or keep it all to yourself, your choice! You’ll also become and Apple Angel and get an invite to our supporter party in 2019. A private visit for you and up to 5 of your friends to our cider house to experience cider making, cider tasting and then take away some juice and cider at the end of the day, plus become an Apple Angel with your name on the wall at our cider house and get an invite to our supporter party next year. A two night stay in St Pancras Clock Tower! A two night stay in the Clock Tower above St Pancras station for you and up to 3 of your friends. A unique opportunity to stay in a truly stunning apartment in the heart of London. Check out the details here - www.stpancrasclocktower.co.uk Become an Apple Angel and get an invite to our supporter party. Dates subject to availability. A limited edition run of our new cider product which we are launching in the spring 2019, with labels tailored to acknowledge the support of you or your company. You will receive a box of 50 bottles of the cider and your company will be acknowledged on 500 bottles. Plus your name on the wall at our cider house and an invite to our supporter party. We will come and design and plant an orchard for you. Using permaculture principles we will assess your site, come up with a design that suits your vision and what would work on the site long-term, and then return to plant an orchard with up to 10 trees or fruit bushes. Plus your name on the wall at the cider house and an invite to our supporter party.